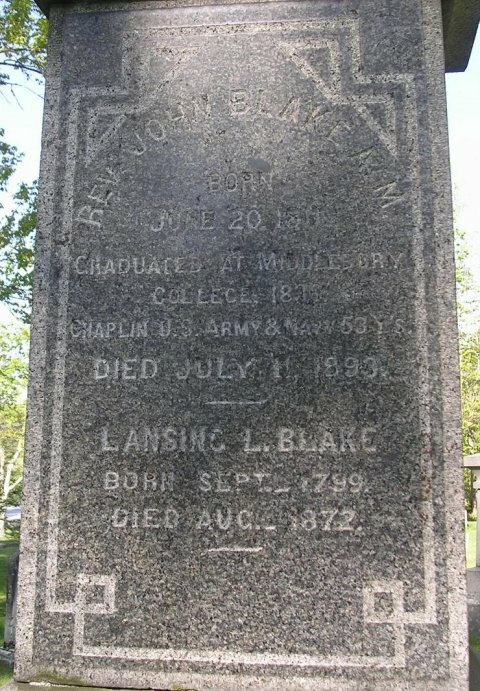 Service: Chaplain, 1st US Arty 1840-1845, Chaplain USN 1847-1873, frigate Congress, Brazil Squadron 59-61, storeship Vermont 63-64, storeship New Hampshire 64-66, receiving ship Vermont 66-73, retired 6/20/73 [College: MC 36]. Episcopalian. Rev. John Blake of New York, who died July 11, leaving an estate valued at $100,000, bequeathed 55,000 to charitable institutions, including $500 Middlebury College, and 20,000 to the Episcopal Diocese of Maine. New York Times, March 27, 1865, Charleston, S.C.